You can now organise your contacts in anyway you like. Divide them to groups. 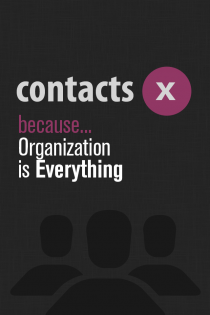 If you think that a contact belongs to more that one group, assign it to multiple groups. All this from your iPhone without the need of connecting to iTunes or a computer. 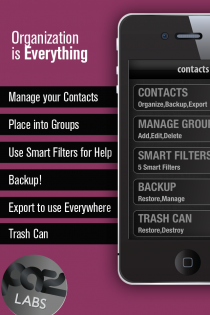 Want to clean you address book and worried about accidentally deleting contacts. We have that covered with our Trash Can. Multiple contacts can be selected and deleted with the touch of a button. 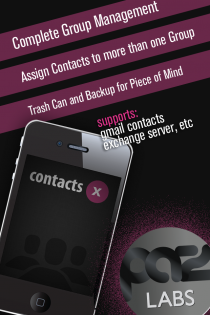 All deleted contacts end up on our Trash Can, where they can be easily restored. You can now select multiple recipients and send email to all of them. You can now select multiple recipients and send SMS to all of them. Want to keep a separate copy of your contacts or email them, just use our export facility. Select the contact or contacts you want and click export. Mail app will open with a vCard attachment that contains the contacts selected. If that is not enough, you can also get a Backup of your contacts. That is easy too, select the contacts you want to backup and click backup. A new group is created under our Backup feature. 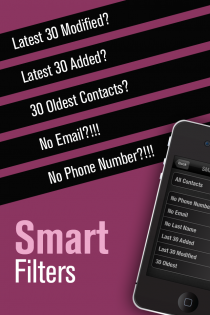 Use our Smart Filters to help you find contacts, that was very hard to identify before. Your iPhone is synchronizing contacts with more that one source (iCloud, Microsoft Exchange, Gmail Contacts), we have that covered. You can access all the contacts you can see on you iPhone address book. Want to copy contacts from one source to the other, select the contacts you want and then tap “assign to group”. A list will appear with all sources and groups available. Tap the source or group you want them assigned and done, it is that simple. Contact import or synchronization is not required as ContactsX is accessing the contacts stored on your iPhone address book. Any changes made on ContactsX, including group assignments and creation are also made on your iPhone address book.